Campstore — RV supplies, liquid propane, live bait, fishing tackle, locally made crafts, public phone (no food). The Indian Lake Village is a ½ mile from the Park for food shopping, laundromat, car wash, convience stores, gas, pizzeria, ice cream parlor and more! Your Hosts: George and Jeannie P. Puterko (518) 648-5843. "Located in the Heart of the Adirondacks"
Welcome to Thornbush Acres! The area boasts with trails to hike, mountain biking and road biking. Indian Lake is known as the whitewater rafting capitol of New York with abundant spring rafting and limited summer rafting. The area has many lakes, ponds and rivers to canoe, fish or swim in. 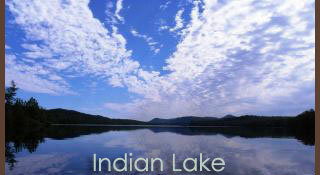 The Park is located in the middle of Three lakes, just a short distance away. There are 11 lakes within a 15 mile radius. For Musical concerts, theatre performances, art exhibits, and classes for children and adults in painting, pottery, woodworking and more, visit The Adirondack Lakes Center for the Arts (schedule of events available in the campstore). To learn more about the Adirondack Mountains — The Adirondack Museum in Blue Mountain is perhaps the finest privately owned endowed museum in the US. Allow at least four hours for a tour of both indoor and outdoor exhibits. The W.W. Durant, a 60' double deck cruiser on Raquette Lake offers several scenic excursions, narrated, some with lunch or dinner — a highly recommended trip! For a touch of local history, The Indian Lake Museum has limited hours but is an interesting place to visit. There is also a very fine golf course in Indian Lake. Cedar River Golf Course has 9 holes plus a driving range and is just a short distance from the Park. Indian Lake Theater is a non-profit multi-purpose community center, a space for the same great movies that have been showing for years, plus community theater, concerts, and other special events.